Two Beacon Hill schools were among 21 Seattle schools honored by the Office of Superintendent of Public Instruction and the State Board of Education with 2011 Washington Achievement Awards. Maple Elementary School was one of the eight schools recognized for overall excellence at the elementary level. Asa Mercer Middle School was one of five schools recognized for overall excellence at the K-8, 6-8, or 9-12 levels. Mercer was also recognized for outstanding achievement in mathematics and outstanding achievement in science. Nearby Franklin High School was also honored, for outstanding improvement. The Seattle honorees were among 186 Washington schools to be recognized for their performance on the “Achievement Index,” which measures schools’ performance over time. (Find out more about the Index and the Achievement Awards here.) The 21 schools honored for 2011 are up from 13 in 2010 and seven in 2009. The schools will be recognized during a ceremony on April 25 at Mariner High School in Everett. Beacon Hill’s Asa Mercer Middle School is one of five public schools in Seattle that has been recognized as a “School of Distinction” for outstanding academic achievement in improving math and reading. Schools with this honor have placed in the top 5 percent of highest-improving schools in Washington. The other schools in Seattle to earn this honor are Alki Elementary School, Hamilton International Middle School, Madison Middle School, and Orca K-8 School. Mercer has received this honor for the last three years in a row. Congratulations to everyone at Mercer! 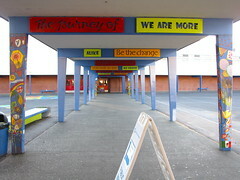 A brightly-painted walkway at Mercer Middle School. Photo by Wendi. Walkway at Mercer Middle School. Photo by Wendi. 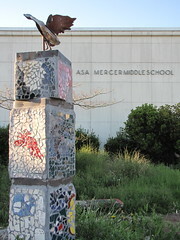 Beacon Hill’s Asa Mercer Middle School is one of thirteen Seattle Public Schools to be honored for winning a Washington Achievement Award. Mercer’s award is in the category of Overall Excellence; the school was also recognized last year. Schools are selected for the award based on their statewide assessment data for the three previous years, and awards are given for overall excellence as well as for special recognition in language arts, math, science, graduation rate, improvement, and closing achievement gaps. 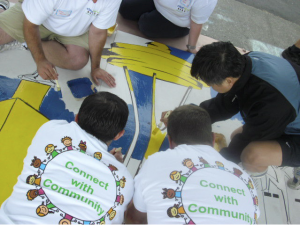 The award ceremony will take place at 9 a.m. on Wednesday, April 27, at Lincoln High School, 701 S. 37th St, Tacoma. Other Seattle schools honored include AS#1, Catharine Blaine K-8, Bryant Elementary, Concord International School, Frantz Coe Elementary, John Hay Elementary, Home School Resource Center, Loyal Heights Elementary, McGilvra Elementary, Mercer Middle School, Montlake Elementary, NOVA, and Schmitz Park Elementary. As a result of high expectations and standards, student behavior has improved. Instead of suspensions, the school now tries to keep kids with behavior problems in class, monitors them and offers old-fashioned nurturing, guidance, and what we might just call “hand-holding.” In the month of September, Mercer had no suspensions or expulsions. None. Zero. That fact alone is cause for celebration. Couple it with the surge in academic performance, the spirit of expectation and hope in the hallways and classrooms, and Mercer Middle School is a shining star on Beacon Hill. Read the rest on Tim’s blog.